This white muslin has white vines with light pink flowers. Muslin began being imported to Europe in the 17th century and some said they were so fine you could hardly feel them in your hand. 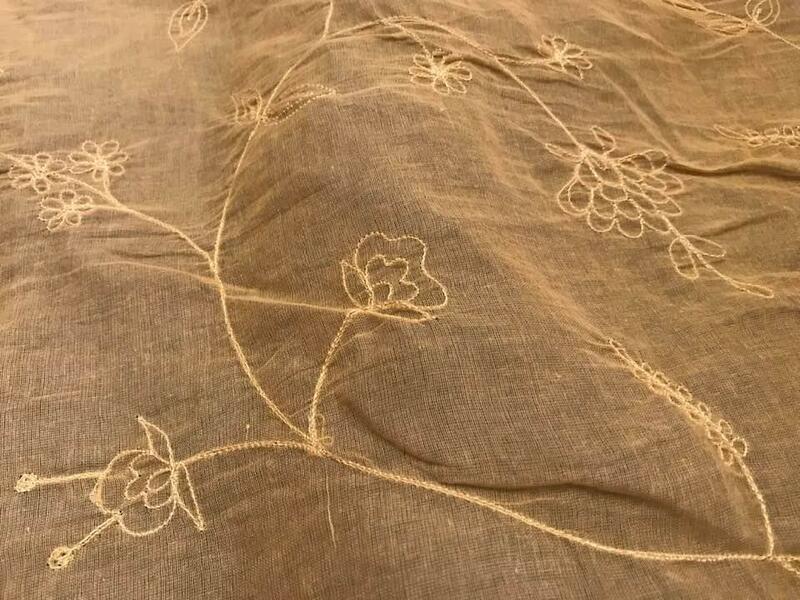 Sprigged muslin first appears in quantity toward the end of the American War for Independence and soon was used in making empire style gowns, handkerchiefs and chemisettes. In the The Proceedings of the Old Bailey, London of 1813, a witness said, "they asked for some sprigged muslin. I shewed them some muslins myself; at the same time I was shewing another customer some handkerchiefs. I left the customer to shew them the muslin, and while I turned round to fell the price of the handkerchief, Jones took the muslin. I missed the muslin in about five minutes after. Q. What was the quantity of that piece of muslin that was missed - A. Five yards. That was sprigged muslin. I asked them six shillings a yard for it. Jones went out of the shop, telling Williams that they were cheap." Off white linen thread for hand sewing will match this fabric.